During the March for Life in Washington, DC, USA a confrontation occurred between some young teens and some Native Indians. Social media was quick to condemn a group of teens from a Catholic high school. However, an independent investigation has revealed that the boys did not instigate the confrontation. The videos also show that the Native group approached the teens. I am pleased to inform you that my hope and expectation expressed in my letter to you of 25 January that the results of our inquiry into the events of 18 January at the Lincoln Memorial in Washington, D.C. would “exonerate our students so that they can move forward with their lives” has been realized. 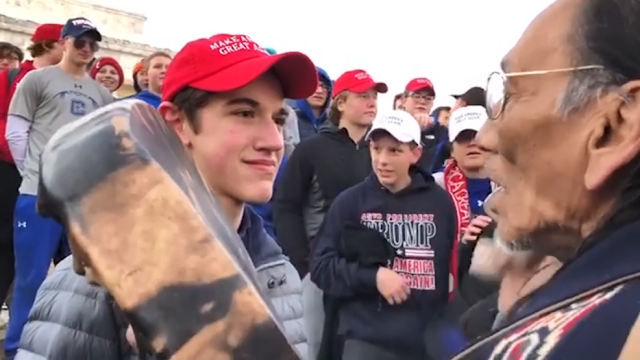 Our inquiry, conducted by a third party firm that has no connection with Covington Catholic High School or the Diocese of Covington, has demonstrated that our students did not instigate the incident that occurred at the Lincoln Memorial. In these past several weeks since the original video went viral two well-worn and oft-used adages have come to mind: Seeing is believing and Perception is reality. The immediate world-wide reaction to the initial video led almost everyone to believe that our students had initiated the incident and the perception of those few minutes of video became reality. In truth, taking everything into account, our students were placed in a situation that was at once bizarre and even threatening. Their reaction to the situation was, given the circumstances, expected and one might even say laudatory. These students had come to Washington, D.C. to support life. They marched peacefully with hundreds of thousands of others – young and old and in-between – to further the cause of life. These young high school students could never have expected what they experienced on the steps of the Lincoln Memorial while waiting for the busses to take them home. Their stance there was surely a pro-life stance. I commend them. I thank our students and their parents for their patience while the inquiry we ordered was completed. The final investigative report is available at www.covdio.org. Once again I affirm my complete trust and confidence in our Principal of Covington Catholic, Mr. Robert Rowe. Under his guidance these past 11 years great strides have been made at CovCath in every area from curriculum to Catholic identity. He joins me in the sentiments expressed in this letter. I also affirm my confidence in our CovCath students. As for the future, we trust in God and in the spirit of CovCath, a spirit that will not die! Thank you for sharing the breaking news. I love to hear all the upcoming news very firstly.